Today Nicely Made in China (NMiC) shares with you a beautiful story and a great product. Annalisa Ryle arrived in Hong Kong 13 years ago via the volunteer route working with the St. Stephen’s Society – in fact her office is still on the charity’s premises in Hong Kong. 5 years ago she founded Bez & Oho (after the biblical characters Bezalel and Oholiab), a company which makes cool handbags out of recycled rice bags while providing jobs to vulnerable people. 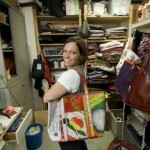 Annalisa, can you tell Nicely Made in China readers how a girl from Boulder, Colorado ends up making quality handbags out of recycled rice bags in Hong Kong? I always wanted my life to make a difference in other people’s lives. I felt that if I could change 1 or 2 lives then I would not have wasted my time. We all need something to do – a job – and I thought that if I could create a company that could mix doing business with helping vulnerable people it would be a great combination. At the same time to cut down on waste, I thought why not turn those rice bags into cool bags and wallets. And that is exactly what we do: we help people, and we make cool products, which I think reclaim the funky soul of Hong Kong. 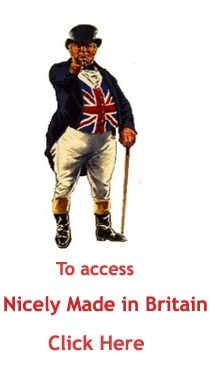 So how do you source the material? 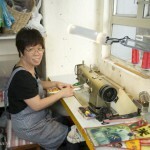 Sham Shui Po is a part of Hong Kong where many companies from the fashion industry come to source their materials. We buy the leftovers: rice bag material, remnant denim, fabrics by the yard, and so on….with a yard of fabric we can make two bags. We also receive rice bags from Zhuhai in Mailand China. We sift through what we’ve bought and keep only the best material. The women in the workshop then start cutting, stitching and assembling the handbags, card-holders, wallets and the various products that we do – about 30 different products in all. The hardware is of the highest quality: the zippers come from YKK and the clasps are nickel free. Great care is taken with the stitched parts – in response to clients’ feedback, all the important parts are now double stitched. I am! But now we also come up with creations based on clients’ requests. For an extra fee those who wish can come to the studio to choose with us the fabric they like. 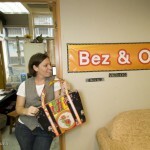 How do we know that we have a real Bez & Oho bag? Two ways: Our bags are always made of 3 layers – the rice bag on the outside, a layer of fabric inside and in between another layer called “pok” in Chinese to make the bag stronger and last but not the least on the outside there’s a little blue button. That’s how you know you have a real Bez & Oho. 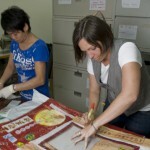 First on our website: www.bezandoho.com and in Hong Kong at Asian Artworks Gallery, 109 Repulse Bay Road.